We made these crunchy treats when Gaspard the Fox illustrator, James Mayhew came to visit our little bookshop in Kenilworth. This recipe includes a little honey because our town has been making honey for over a thousand years; we still have an area called Beehive Hill and there are many honey-makers working here today. 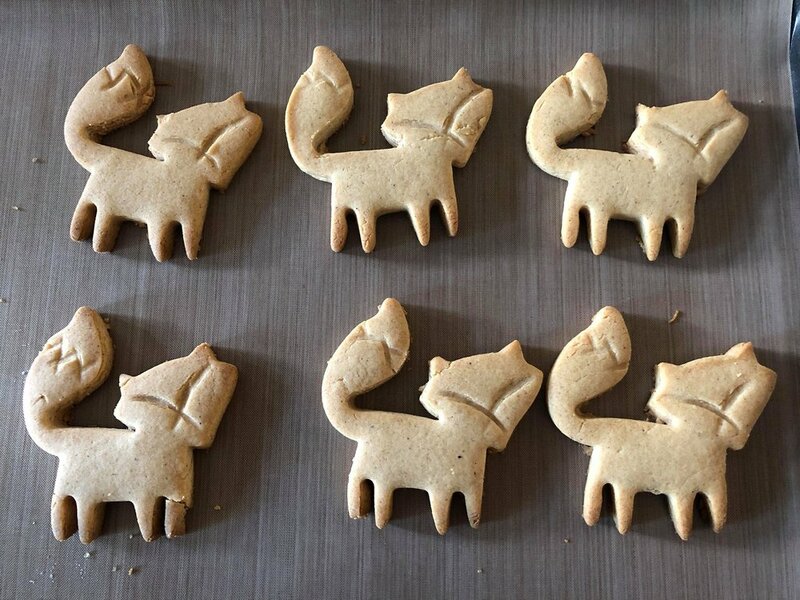 Gingerbread is an ideal colour if you want to make fox biscuits, so find yourself a fox-shaped cookie cutter and get baking! 400g Fine Sponge Flour (Plain) - you can use ordinary plain white flour if you like, but we do like the finely ground flour as it makes biscuits extra specailly nice. 1 tablespoon of honey - why not see if someone makes honey locally to you and buy some from them? 3 generous teaspoons of ginger - we like our gingerbread properly gingery, but you can adjust this so your biscuits are the way you like them. Line a few baking trays. Put the softened butter, the sugar and the spices into a bowl and beat them well until they are really soft and fluffy. If you have one, use an electric whisk. If you don't have one, put some welly into it and think of it as good exercise. When it looks fluffy and pale, add in the honey and beat it in. When you are using a biscuit cutter with a shape, like our fox, you don't want it to spread out in the oven as it cooks. There are things you can do to stop this happening: firstly, you need a good firm dough. So next add in the flour bit by bit until its all mixed in. Don't be afraid to add in a little more, you want your dough to be firm but not crumbly. If the dough if very soft, the biscuit shape will splodge out in the oven as the butter melts. When you've got your gingerbread dough all ready, roll it out on a flat, clean surface. Don't roll it too thin; when you are using a shaped cookie cutter, a thicker biscuit helps ensure that the shape stays together and that things like tails don't snap off too easily! Press out your foxes, and carefully lift them into the baking trays making sure they don't touch. We used a teaspoon to add a few simple markings onto our fox, you can do this if you like. The next thing to do is to put the trays of unbaked biscuits into the fridge or somewhere very cool, to chill properly for at least two hours. This also helps the biscuits keep their shape when they cook. We normally leave them in the fridge overnight and then bake them early in the morning - there is nothing nicer than a house that smells of freshly baked gingerbread early in the morning! When you are ready to bake, pre-heat the oven to 180C/350F/Gas Mark 4. Put the chilled biscuits straight from your fridge into the oven and bake them for about 15 minutes, turning them round half way through. All ovens are different, so do check them - you want them to be nice and golden and starting to brown at the edges. When they are cooked, take them out of the oven and leave them on the tray for five minutes or so. A freshly baked biscuit is very soft, so it is easier to take your foxes off the tray when they have hardened a little. Do this carefully and slowly so they don't break. Your biscuits are baked, so now you can invite some nice people over and have a really good natter over tea and biscuits.